2018 and the years leading up to it have created a very divisive and politically challenging environment for a number of Federal employees. With shifting priorities, Agency consolidation recommendations, budget reductions, resignations of key senior administration officials coupled with a significant increase in departures of senior executive servants, Government employees find it sometimes difficult to remain focused on accomplishing their work and striving towards achieving their agency’s mission. Federal employees must remain apolitical at work, but certainly the changing political landscape can impact them in their day to day. 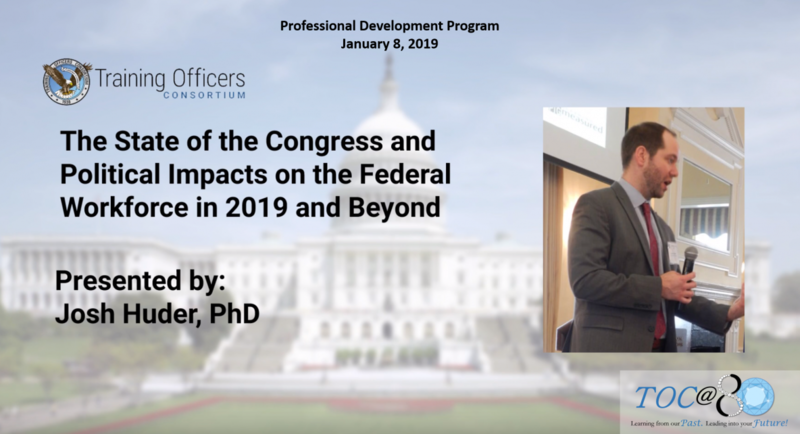 In this Professional Development Session, join Dr. Joshua Huder, Senior Fellow of the Government Affairs Institute at Georgetown University, as he discusses Congress, the presidency, its effects on the Federal workforce and American politics in 2018 and what’s in store for 2019 and beyond. Josh joined the Government Affairs Institute as a Senior Fellow in 2013. He has taught courses on American government, advanced legislative process, and other American politics courses. He has provided political analysis to several news outlets, including the Washington Post, Congressional Quarterly, Newsweek, Bloomberg News, CNN, the Washington Examiner, U.S. News, Al-Jazeera, Yahoo News, and is a regular contributor for the Christian Science Monitor. His portfolio included legislative procedure, government affairs, financial services, voting rights, campaign finance, trade, small business, and other issues. He is currently writing a book on the history of congressional procedure and politics since 1879. This session promises to very informative, engaging and top of mind for a lot of Federal employees as we begin under a new Congress after a turbulent mid-term election season in November 2018. Discuss administration priorities for 2019 and beyond.